Robert Frazier, of Ansonia, was found guilty of causing harm to a companion animal. Frazier was indicted in January after an emaciated dog was found frozen to death on his property, having apparently been left chained outside in subzero temperatures. 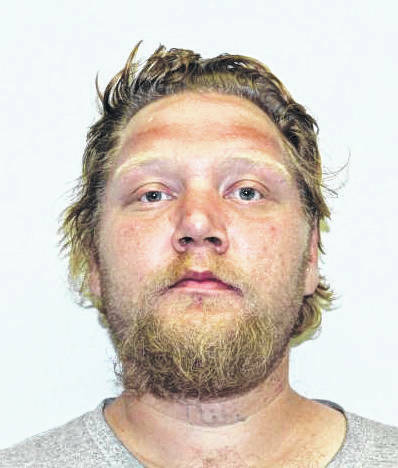 GREENVILLE — Robert Frazier, age 36, of Ansonia, was found guilty of causing harm to a companion animal, a fifth-degree felony, in Darke County Common Pleas Court last week. Frazier was indicted in January after an emaciated dog was found frozen to death on his property, having apparently been left chained outside in subzero temperatures. An agent with the Darke County Humane Society found the dog deceased outside Frazier’s home in December. The agent reported the dog was chained up outside without access to food or water. According to the Humane Society, Frazier’s felony indictment and conviction are the first to take place in Darke County under new animal abuse laws adopted by the Ohio legislature last year. Judge Jonathan P. Hein sentenced Frazier to 30 days in jail, with 16 days credit for time served. He was also ordered to pay restitution and court costs. Carl Crumble, age 37, of Greenville, pleaded guilty to charges of failure to comply with order or signal of a police officer, a third-degree felony. Crumble appeared in February following an incident in which he was observed speeding and running multiple stop signs near downtown Greenville. Crumble ultimately ran a red light at Broadway and Water Street, then lost control and struck a vehicle parked in front of a nearby residence. The arresting officer witnessed Crumble running from the crashed vehicle and pursued, resulting in a struggle in which the two men fell to the ground. This allegedly resulted in serious injuries to the arresting officer’s arm. Judge Hein accepted Crumble’s guilty plea and entered a judgment of conviction. His next court appearance is a sentencing hearing, to be held August 29. Codi Byrd, age 21, of Greenville, was sentenced to five days in Darke County Jail on charges of assault, a fourth-degree felony; underage consumption and resisting arrest, both first-degree misdemeanors; and domestic violence, a fifth-degree felony. The assault charge was amended from a charge of assaulting a peace officer in accordance with a plea agreement between Byrd and the Darke County Prosecutor’s Office. Cynthia Moyer, age 45, of Greenville, was sentenced to one year of imprisonment in the Ohio Reformatory for Women on charges of aggravated vehicular assault and endangering children. The charges stem from an incident in November of last year that resulted in serious injuries to a child. Moyer was allegedly driving while under the influence at the time. Judge Hein also ordered a one-year driver’s license suspension. Christopher Elliott was scheduled to enter a guilty plea to charges of unauthorized use of a vehicle, a fourth-degree felony, and driving under the influence, a first-degree misdemeanor. The charges stem from an incident in October of last year in which Elliott lost control of his vehicle and struck a utility pole near Fort Jefferson. A warrant for Elliott’s arrest was filed following his failure to appear in court Thursday. https://www.dailyadvocate.com/wp-content/uploads/sites/34/2018/06/web1_Robt-Frazier-MUG.jpgRobert Frazier, of Ansonia, was found guilty of causing harm to a companion animal. Frazier was indicted in January after an emaciated dog was found frozen to death on his property, having apparently been left chained outside in subzero temperatures.